...Coming November 8th from the Twilight Time series of limited edition DVDs: THE LEFT HAND OF GOD (1955) starring Humphrey Bogart and Gene Tierney. It will include an isolated music score track. ...Missy has a fun, thoughtful post comparing the O'Hara family of GWTW with the Crawleys of DOWNTON ABBEY. ...Kevin's Movie Corner reviews LOVE IS A MANY-SPLENDORED THING (1955) and pays tribute to William Holden, who had a remarkable run of outstanding films in the 1950s. 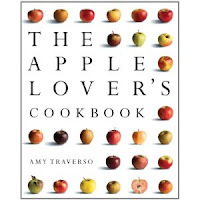 ...New cookbook: THE APPLE LOVER'S COOKBOOK by Amy Traverso looks appealing, and it's certainly perfect for a fall release. ...I'm not a comic books fan, but my kids have been "geeking out" over the trailer for next summer's THE AVENGERS (2012). For those who are MAVERICK fans, this film seems to be kind of the equivalent of "Shady Deal at Sunny Acres," rounding up all the different Marvel superheroes in one story. ...As for me, I enjoyed the trailer for THIS MEANS WAR (2012), due out in February. It stars Chris Pine, Tom Hardy, and Reese Witherspoon in what looks like a lighthearted spy caper with cartoony violence in the vein of MR. AND MRS. SMITH (2005), which had the same screenwriter. ...Adam reviews Fred MacMurray and Ava Gardner in SINGAPORE (1947) at OCD Viewer. I also enjoyed it when I had the chance to see it earlier this year; it's flawed but interesting. SINGAPORE is one of several films I've seen in recent months directed by John Brahm. ...Comet Over Hollywood pays tribute to the lovely Laraine Day. ...TCM has named the guest hosts for October 17th through November 6th. October 17th through the 23rd, film critic David Edelstein will host. Actress Lorraine Bracco does the honors October 24th through 30th, and historian Donald Bogle will be the host starting on Halloween and running through the 6th. As mentioned here a few days ago, Robert Osborne returns from his lengthy break on December 1st. ...At Shadows and Satin Karen has an excellent profile of my favorite slimy heel, Zachary Scott. 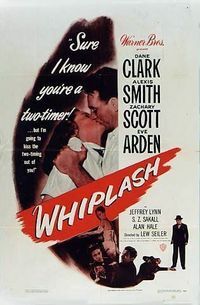 I really enjoy Scott, whose memorable performances as bad guys include MILDRED PIERCE (1945), WHIPLASH (1948), COLT .45 (1950), and THE SECRET OF CONVICT LAKE (1951). It's also interesting seeing him as more sympathetic characters in films like FLAXY MARTIN (1949) and SHADOW ON THE WALL (1950); I have a DVD of THE SOUTHERNER (1945) which should be very interesting. I'm looking forward to recording his film THE MASK OF DIMITRIOS (1944) from Turner Classic Movies on October 20th. 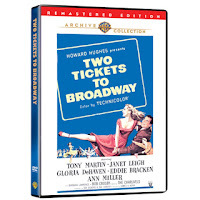 ...Like Zachary Scott, Alexis Smith spent much of her career at Warner Bros. Jacqueline has a perceptive look at Smith's career at Another Old Movie Blog, including YouTube video of Smith on Broadway. ...After reading this post at Tales of the Easily Distracted, I'd like to see MIRAGE (1965) with Gregory Peck and Diane Baker. 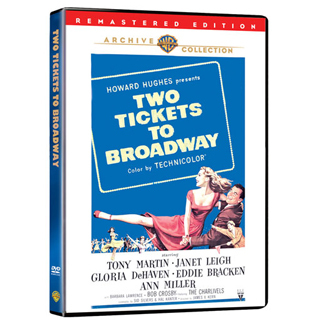 ...Although I love movie musicals, I've never seen TWO TICKETS TO BROADWAY (1951), starring Janet Leigh, Tony Martin, Gloria DeHaven, Ann Miller, and more. Glenn Erickson's positive review of the remastered Warner Archive release definitely caught my interest. ...The film movie camera is dead? Wow. ...Attention jazz fans: My dad pointed the way to JazzWax, a blog which is sure to interest those who love jazz. I enjoyed reading an interview with Chico Hamilton, who appeared in YOU'LL NEVER GET RICH (1941), starring Fred Astaire and Rita Hayworth. ...Notable Passing: Australian actress Diane Cilento, a Supporting Actress nominee for TOM JONES (1963) who was once married to Sean Connery, has passed away at the age of 78. Connery and Cilento's son Jason Connery is also an actor. Thank you so much for the link, and also for the heads up on the piece about Zachary Scott. He was a great "slimey heel". 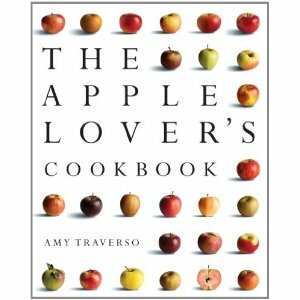 That apple cookbook looks great - I love apple desserts and have been meaning to try some new ones this fall. Nice to see something about Laraine Day - I saw Foreign Correspondent for the first time recently and thought she was lovely. Laura, thanks a million for your nice shoutout for MIRAGE, the second movie in TALES OF THE EASILY DISTRACTED's 3-part blog series "Try to Remember: The Amnesia Trilogy"! By the way, the finale will be on Friday, with Gregory Peck back for more amnesia-fueled suspense in Alfred Hitchcock's SPELLBOUND. So sorry to hear about Diane Cilento's death, though. She was among our family's favorite actresses. Ironically, I had already planned to blog about one of our favorite Cilento movies, THE WICKER MAN, on Halloween weekend; I guess it's as good a swan song as any, huh? Anyway, your "Around the Blogosphere This Week" is a great, informative read, as always! Thanks again!